Few places in the world conjure up the allure of mystery rooted in history that Egypt does. Dotted with incredible feats of engineering such as the pyramids and Great Synx, divided by a great serpentine river and boasting one of the most impressive and technologically advanced civilizations of the ancient world, it’s little wonder that this desert land has been inspiring travelers and world culture lovers for centuries. Just as the sands, monuments and places of Egypt have been beckoning people to it for ages, so too have people strove to adorn their homes and/or bodies in Egyptian inspired looks. In the early 1920s when archaeologists unearthed the tomb of legendary pharaoh Tutankhamen, it seemed as though overnight the world was swept up with Egyptian fever. In fashions of the era one can clearly see the influence of Egyptian style in pieces bedecked with, or shaped to look like, such symbols as lotuses, mummies, scarab beetles, pyramids, ankh crosses, and beading and stitchery that invoked a distinctly Egyptian feel. If you’d like to read more on how Egypt influenced clothing styles of the 1920s, I highly recommend a detailed article entitled Old World, New World: Fashion is King. In the mid-twentieth century misses and ladies wear – particularly skirts and dresses – sometimes featured wonderfully whimsical patterns of the sort that you’d be hard pressed to find on a newly produced garment (think large pineapples, Scottie dogs, and Parisan street scenes to name but a few). Recently while browsing etsy I came across an absolutely charming cotton summer dress featuring a fabulous Egyptian motif around the bust and at the bottom of the hem, that would be a sublime way of adding a jolt of Nile style to your vintage look! The title of this post is a play on the 1980s Bangles hit song “Walk Like An Egyptian”, which I thought might be a fun means by which to highlight some of the ways that Egyptian culture has touched peoples’ closets over the years. If you’d like to incorporate more elements of Egyptian style into your wardrobe this can be achieved with the use of certain colours (think gold, brass, turquoise, saturated jewel tones, onyx, cobalt blue, and creamy white), lightweight fabrics such as linen and hemp, and (reproduction) Egyptian style jewelry. 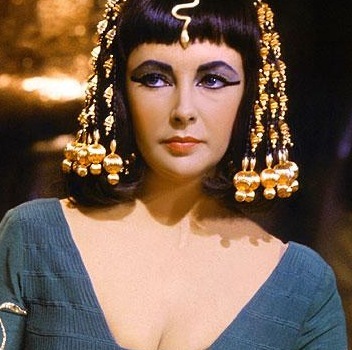 Whether you go for an Egyptian inspired look from head to toe such (such as the dress above) or prefer to stick with thick black eyeliner, there is no denying that this fascinating culture has helped to shape not only the development of human history but also the world of twentieth century fashion. Love the post, and love that dress in the last photo, I'm going to check out that Etsy seller now. Have a great day! Have always loved the inspiration of Egypt! Very geometrical and colorful. It keeps reviving and I hope it never goes away. Great post! Oh what a lovely collection of items. I particularly love the glasses (very Edna Everage!) and desperately want the dress... wish I could afford it! Hi sweet ladies, thank you so much for your wonderful comments! Thank you again for commenting, everyone. Have yourself a marvelous day! I love Elizabeth Taylor!! She is one of my favs for makeup! !